Dominos Coupon Codes and Deals. 1 Dominos Coupon Codes and Deals. 1.1 What is Domino’s Pizza? 1.2 Dominos coupons and coupon codes. How do they work? See all Dominos coupons, special deals and Dominos promo codes for free, without having to click on anything! You can get up to 50% off at Domino’s pizza simply by using a Domino’s coupons code online. I will assume you are just like me, and a really big fan of pizza and a huge fan of Domino’s Pizza in particular. If this is the case, then you have arrived at the right place. This website and page is here to give you the most recent Domino’s coupon codes for 2015, thereby letting you enjoy your Domino’s pizza at a discount the next time you place an order at any one of Domino’s Pizza company’s many outlets. Headquartered in Ann Arbor, Michigan, Domino’s Pizza, Inc. is an international pizza delivery company. It had its beginnings in 1960, when James and Tom Monaghan, purchased DomiNick’s and renamed it Domino’s Pizza. At this time Domino’s Pizza is the second largest pizza chain within the United States, second only to Pizza Hut. They have over 9000 franchised and corporate restaurants and outlets located in 60 countries. Their menu features both meat pizzas and vegetarian pizzas, along with boneless chicken and chicken wings, garlic bread, and a multitude of desserts, including Ben & Jerry’s ice cream, and cookies. You can find a Domino’s Pizza restaurant in every major city around the world including Tokyo, New York, and London. The first of many Domino’s Pizza franchises, opened in 1967, in Ypsilanti, Michigan. Originally they had planned to add one dot to the company logo for every new restaurant, however, because of the rapid growth of Domino’s, that idea was quickly shot down. The logo now has three dots which represents the three stores that were open at the time of the logos’ creation in 1969. By the end of 1978, the Domino’s Pizza franchise had grown to its 200th store. Dominos coupons and coupon codes. How do they work? The first thing you need to keep in mind is that only one Domino’s coupon per order is allowed to be used. When you are ordering pizzas online, you will use a Dominos promo code, which you will enter during checkout. Printable Domino’s coupons for 2015 will need to be printed out beforehand and are typically presented at the store register, when you pick up your pizza order. You are not allowed to use a promotional code and a printed coupon with the same order. One of the nice features of Domino’s Pizza discounts and deals is that they are not limited to just pizzas, or large pizzas. By looking below, you’ll see that a great deal of the discounts offered by Domino’s Pizza are for combos or for sides, such as garlic bread or drinks. Like most coupon codes, Dominos coupon codes for 2015 have a date of expiration and will not be valid after that date. It is important that you always check the expiration date before trying to use the coupon. If you should come across a newer valid discount code for 2015, please add them to the comments section for others to enjoy. We strive to update this page every two months so that we can give you the most recent coupon codes available. Many times the Domino’s promo codes will actually double your order. At other times you may receive a free side order with your purchase. 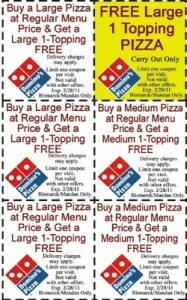 Dominos Coupon Codes cannot be combined with printableCoupons such as this one. Infact, as online booking is become the norm, the old printable coupons become less and less popular. This website does not have any affiliation with any major pizza restaurant in any form; it is strictly intended as a portal for coupons for pizza lovers to get the latest deals, as well as information regarding the use of Domino’s Pizza Coupons. As a reminder, keep checking back to this page to find the newest information and coupon codes for Domino’s Pizza. If you have a new, working code, please feel free to share it with others in the comment section. Domino’s Pizza has half off all pizzas when you order online today through Sunday, December 4, 2016. The 50 percent off deal is only available on menu-priced pizzas ordered through Domino’s online ordering channels which include Domino’s website (dominos.com), as well as Domino’s ordering apps for iPad®, iPhone®, Android™, Windows Phone 8 and Kindle Fire®. Get 50% off all pizzas at menu price when you order Dominos pizzas online at Dominos.com. This deal expires on 12/06/2015. Offer only valid at participating locations. Dominos Pizza has 50% off deal going on for all menu-priced pizza orders placed online. The pizza deal is valid through Sunday, Dec. 6, 2015. The 50% off deal is only available for moralm menu-priced pizzas ordered through Domino’s website (www.dominos.com), and the Dominos iPad®, iPhone®, Android™, Windows Phone 8 and Kindle Fire® apps. Amazing deal! Select Dominos Locations Only. Limited time only and participation varies by location. just $7.99 For 1 Medium 3 Topping Pizza. Free Gift at select Dominos locations: Free 16 Piece Order Parmesan Bread Bites With Any Pizza Purchase. Not valid with any other offers. Valid at most Southern California locations. Expires on 01/15/2015. Buy 2 Sandwiches And A Large 1 Topping Pizza For just $20.99. Any 2 Oven Baked Sandwiches plus 1 Large 1-Topping Pizza for $20.99. Limited time offer. Take 50% off Any Pizza during Global Pizza Week. Get a Large Specialty Pizza for just $11.99. Get A Medium 2-Topping Handmade Pan Pizza for Just $7.99. Get a Large 3-Topping Pizza For $7.99 (Carryout Only). Dominos Charity Meal Deal For just $19.99! Heres how you eat well and give to charity at the same time! Get One Medium 1-Topping Handmade Pan Pizza, 16 Piece Parmesan Bread Bites,, One Medium 1-Topping Hand Tossed Pizza, 2-Liter of Coca-Cola, and a $1 Donation to the St Jude Childrens Hospital for i low $19.99. Choose Any 2 For $5.99 Each! Choose Any 2 or More: Medium 2-Topping Pizza, Oven Baked Sandwich, Stuffed Cheesy Bread, 8-piece Chicken, or Pasta in a Dish For Just $5.99 Each. Apply promo code for checkout. Get A LARGE THREE TOPPING PIZZA for 7.99. Great Dominos.com offer: Get 2 LARGE 1 TOPPING PIZZAS AND A 2-LITER OF COCA-COLA FOR $20.99 at Dominos! Smashing deal: Any Two Medium 2-Topping Pizza, Oven Baked Sandwich, or Stuffed Cheesy Bread for an unnatural $5.99 Each! Expiration unknown. Use this Dominos coupon code: EMTW8PX7.
. Works for delivery or carry out. for Dominos.com: Choose Any 2 for $5.99 each: Stuffed Cheesy Breads and Medium 2-Topping Pizzas (2-item minimum) and save dough! Many have successfully used the Coupon Code: 9118 for 3 LARGE 1 TOPPING PIZZAS for $7 AND 77CENTS for EACH pizza at dominos.com. Use the Dominos Coupon Code: EMTT6TW5 for a Large 3-Topping Pizza for $7.99. Carryout only and available on Mondays, Tuesdays, and Wednesdays. Get 50% off on ALL Dominos pizzas at menu prices from 11-17 june 2012. Excellent promotion! 2 Medium 2 Topping Pizzas for $5.99 + 16 Parmesan Bread Bites for $1 Expires: limited time. Coupon Code: EMTB5VT8. Same offer as above. Choose Any 2 Medium 2 topping pizzas or stuffed cheese breads for only $5.99 each. Limited Time Offer. Dominos.com.au: $29.95 2 Value Range Pizzas, Garlic Bread and 1.25L Coke delivered. Expires 31/0/12.